More than 70 homes and buildings are feared to have been destroyed in a bushfire in Australia, authorities say. The fast-moving fire engulfed the New South Wales (NSW) coastal town of Tathra late on Sunday local time. Authorities said locals were evacuated to a nearby town and there were no reports of anyone missing. Earlier, separate blazes in Victoria destroyed up to 18 properties. Authorities described the bushfires as the worst of Australia's summer season. 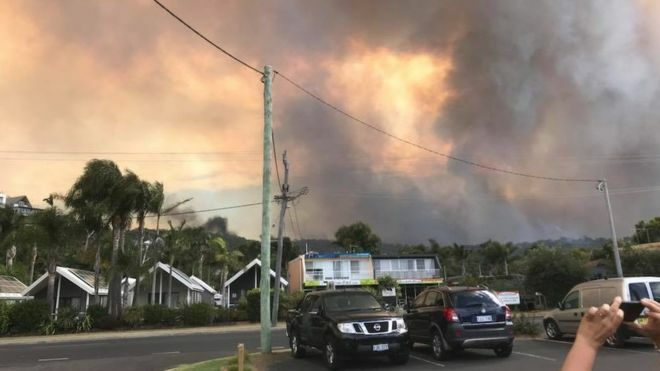 In Tathra, about 450km (280 miles) south of Sydney, four people were treated for smoke inhalation and one firefighter was injured, authorities said. Many residents left the town by walking along the beach on Sunday as temperatures reached up to 38C (101F). "The smoke was thick and black. You could see the rescue helicopter with the water and you know it was all so real," one local, Simone Ward, told the BBC. She said that most people had left with only a few belongings. The town has about 1,600 residents. The fire had not been contained after burning through more than 1,000 hectares, the NSW Rural Fire Service said on Monday. "This fire ran more than 7km (four miles) before it impacted on those properties so there is a huge fire perimeter for us to contain," deputy commissioner Rob Rodgers told the Australian Broadcasting Corporation. He said weather conditions on Monday would make it easier to battle the fire. The bushfires in Victoria destroyed up to 18 properties and killed livestock in rural areas north of the town of Warrnambool, authorities said. The fires affected at least 40,000 hectares and were probably sparked by lightning on Saturday, according to officials. In September, Australians were warned to prepare for a dangerous bushfire season after one of the driest winters on record.